If we can find the time, we like to try out the recipes from the Good Weekend in The Age newspaper. Sometimes these work a treat, like the Moroccan Meatballs, and other times...well, you make do. Elmo magicked the choux pastry into an impromptu tiramisu after our efforts didn't quite work out (though Elmo claims it to be a dodgy recipe - does anyone have any tips?). 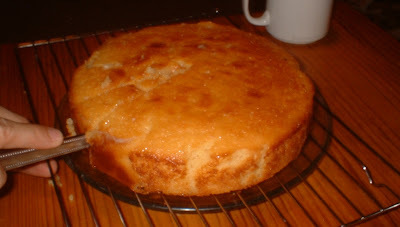 Happily, we can report that the most recent "weekend cook" is a corker: simple, moist and sweet. Low investment, high returns! Beat in eggs, one at a time, until smooth. Gently fold in flour and lemon zest, then fold in yoghurt. Spoon into tin, making the centre lower than the sides. Bake for 40mins, the cake should be golden brown. Lemon syrup: heat water, sugar and lemon juice until dissolved. Simmer for 5 mins. When the cake is ready, leave it in the tin, use a skewer to poke holes all over the cake and spoon the hot syrup over the top. Ensure the syrup soaks evenly across the holes in the cake. Cool the cake in the tin; we served our cake with a dollop of natural yoghurt. For something that looks so good- it's deceptively simple to make! Serenity> why no pix of paella? will post a pic of the sheperd's pie I made over the weekend soon. it's not deceptive m's nemesis...even i could make it - twice! ...mmm...paella...do you have a paella pan serenity later? i'll take pix next time m's nemesis, provided i get around to getting a paella pan. so yeah elmo, no paella pan, just cooked it up in a skillet/fry pan. This looks absolutely beautiful! What a glorious cake!